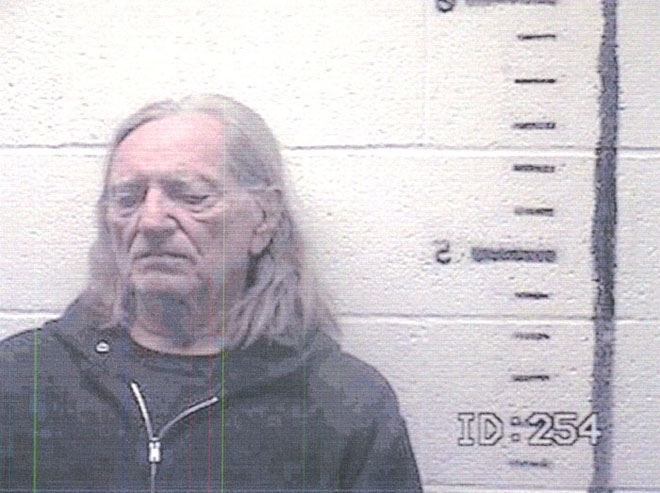 Country music star Willie Nelson was arrested in November 2010 and charged with pot possession after six ounces of marijuana was found on his tour bus at a Border Patrol checkpoint in Texas. The 77-year-old Nelson, who claimed ownership of the pot, was booked into the Hudspeth County Sheriff’s Office lockup and released after he posted $2500 bond. If convicted of the drug charge, the singer faces up to six months in jail. Submitted by SpecialEd on Thu, 2011-06-02 23:06. Submitted by rcmayo on Thu, 2011-06-02 20:37. God bless willie. Talk about awesomeness and standing up. Submitted by Midknight on Thu, 2011-05-12 05:58. You the man Willie! I looked up cool in the dictionary and it just had a picture of you. Submitted by gwbdopesmoker on Mon, 2011-03-21 12:20. Wow . What a easy bust. See Willy's bus drive by, and you are guaranteed a pot procession charge. Yes .. COP's have nothing better to do than harass the old, and semi-retired tax payers of Texas. Submitted by Diddlysquat on Thu, 2011-01-13 00:20. What a waste of police resources - arresting marijuana smokers just minding their own personal business! Submitted by rpearson on Sat, 2010-12-18 07:40. I am a Willie Nelson fan, pot or no pot, but you guys need to learn there's a difference between ICE agents and Austin Police Officers. Submitted by snowflake on Wed, 2010-12-15 21:11. There are more deaths linked to pepole drinking and driving or drinking to much, then there is from pepole smoking weed. What are they going 2 do: get the MUNCHIES and eat themself to death? U dont want to do alot when ur high much less put the effort into finding your keys (can take awhile), walking to car, and finally driving. Takes way 2 much effort. Willie is just smoking what the earth grows!!!! Submitted by enrique78 on Tue, 2010-11-30 16:34. Thank goodness this dangerous 77 year old pothead is off the streets. Nice work, U.S. Border Patrol. Submitted by greenroom on Wed, 2010-12-08 00:15. No kidding. what a joke. Oh no Willie, yikes!!! Keep away from us, you might be too high on life, and we just don't like that! Oh swell, now I truly feel like we're safe again. Thank you, to the walking tomatos with arms & 46 inch waists, that put an end to your heinous crime. I would bet it is safe to say that his pot is not Mexican dirt, but rather the sweet chron from Nor Cal. WE LOVE YOU WILLIE & keep on smokin! Submitted by Barney C on Mon, 2010-11-29 17:37. Everybody knows Willie does pot. Are they just following him around to harrass him ?